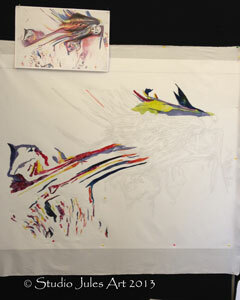 Studio Jules Art - Blog: New Projects in the Works! New Projects in the Works! Oh, there has been so much going on. I just do not know where to start. I have not posted in so long due to staying busy with things around the house and travelling, and you know how I love to travel! My interview with the “Save our Stories” program of Quilt Alliance has been published online. Click here to access my interview. I am so excited that it has been published and is part of quilt history. “Save Our Stories” is such an important program for our industry and fiber history. The Dallas Area Fiber Artists will be presenting a show at Lovers Lane UMC, Dallas, Texas, in September 2013, to promote Alzheimer’s awareness. You know this cause is near and dear to my heart and I am so pleased that the LLUMC Foundation asked us to present this show and that we are able to partner with the Alzheimer’s Association, Dallas Chapter. I am blessed by the committee because they chose my Shattered Curves quilt as the promo quilt for the show. Luckily, it will be back from the Sacred Threads Quilt Show in time for the “Let’s Make Alzheimer’s a Distant Memory” show in September. If you are a local artist and would like to enter art work for the show, here is a link to the information for entering. The theme of the show is "The Mind's Eye". All work is to be related to Alzheimer's and all work must be for sale. The sale proceeds will go to support the Alzheimer's Association (Dallas Chapter), LLUMC Foundation and the artist. I am working on two projects to enter into the show. Here is a peek at both projects. Right now, the first layer of MRI Mirage is fused and basted for quilting. After I quilt this layer, I will add another layer of hand dyed sheers. I have thread for most of the quilt, but I think I need to make a trip to the quilt shop to look for more thread. Yum! Down the Drain is coming along. Seems that I'm working from left and right and going to join the two sides in the middle. Lots of little pieces in this one. 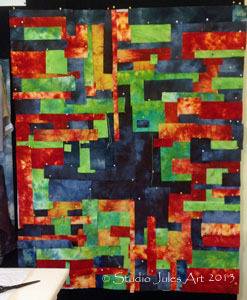 I just love being able to design art quilts and use my own hand dyed fabrics. Okay, to start quilting with the thread I have.